Ah, one of my favorite exercises when you need to get to the bottom of what’s really important. This participatory cut and paste (literally) activity can be used in many different ways with people from all backgrounds and perspectives. Not too long ago, I conducted an innovation session with a failing locally owned bookstore. The owner could not figure out why people weren’t buying. At first one would think the obvious…Bookstores are failing everywhere, the economy is experiencing a tantrum of epic proportions. To top it off iPads, Kindles and Android tablets provide instant books at the swipe and touch of a finger. Makes total sense. There is more to the story however. The bookstore, located on one of the most busy intersections in the city, with significant foot traffic, is surrounded by plenty of flourishing businesses. Coffee shops, bars, restaurants, eateries all less than a block from an entrance to the second largest city park in the country behind New York’s central park. From my perspective, the store should be doing well since it offered a multitude of options, not just books. Inside one could find greeting cards, a full coffee bar, gifts, various paraphernalia, a large lounge complete with quaint little tables, couch and a long laptop table. The lounge, perfectly situated infront of large north and west facing picture windows, allowed for lot’s of light and the perfect spot to watch passer-bys while you sip on some premium joe or specialty blend iced tea. Surrounding the bustling area, which has a pretty active weekend night scene, are high-wealth homes, 30+ story high-rises and decent parking options. You see, the “bookstore” had all the ingredients necessary to continue it’s history of success. To get to the heart of the matter, the owner of the bookstore invited me to delve into his business. I am sure it was not an easy decision, especially when an owner has been successful for so long. Allowing someone that does not know the business to come in and give recommendations can be a scary thought. This is one of the aspects I love about Heuristics. The process of discovering the intricacies of a complex business and its products and services, then presenting the non-biased findings in an easy to understand way that solves a challenge in a human way. The ability to help make things that are complicated, easier, smarter, more simple….just plain better is without a doubt exciting. With the challenge of helping the bookstore, my responsibility was not to tell the owner what is being done wrong. My task was to present him with options and recommendations based on a methodical process of extracting information, ideas and concepts from stakeholders. Going into the project, I had my suspicions of how a few adjustments would make profound differences. As a UX and HCD practitioner, however, I knew I needed to be careful to never lead to an outcome that I thought was best suited. My opinions are that of just one. When combining the ideas and opinions from a broader stakeholder landscape, my opinion could be way out in left field. As I was planning out a good combination of interactive and participatory exercises for my first session with the managers of the store, I knew “What’s On Your Radar” was an absolute must. The radar is a simple worksheet printed on large paper with three rings. Each ring larger than the next. Within the rings each space is appropriately labeled by importance. The inner ring is “critical”; The middle ring is “Important”; The outer ring is “Peripheral”; and the space outside the rings is “Unimportant”. I presented my plan to the owner and he accepted. I have to say I was really excited. The first thing that needed to be done was develop a full inventory of what the store had to offer. Instead of asking the store to provide an inventory for me, I opted to do the task on my own for a couple of reasons. The first and most important was to really learn what the store had to offer. I would encourage you, when making your list, to do the same. You want to be knowledgeable and able to answer questions when you are working with stakeholders that might not be as familiar with the given product, service or establishment. As I was building my list I set up various buckets. Once I had my list together, I fired up my macbook pro and hammered out a large-font, bulleted inventory list, properly alphabetized with generously sized line breaks. You want to make sure you have good line spacing because the stakeholder will need to be able to cut out line items and tape or glue them to the radar worksheet. Once I was done creating my bulleted inventory list of things the store had to offer, I had everything I needed to conduct this portion of the innovation session. At the managers session it was very important to explain not only how, but also why they are doing this in the first place. At first glance to some this seems like a child’s project of cut and paste. Quickly, however, when the participants are given a packet with a long list of items and asked to cut and prioritize these items and fit them in the limited spaces on the radar worksheet, they instantly realize this may actually be a challenge. Suddenly only limited items on the list can be deemed critical to the business and just a hand full more can be important. To add to the challenge, the radar exercise is timed, in this case I gave the managers 10 minutes as I would with other stakeholders. In the managers innovation session there were 4 participants, so I split them into two groups. I asked the owner and head manager to be in one group, and the other managers in a second group. This helped reduce the likelihood of intimidation. It is a good idea to break up stakeholders in each session. This allows you the opportunity to begin extracting information from stakeholders and how they differ on what they deem as most important to succeed. It also keeps the playing field level and prevents “the boss” or extroverted ringleaders from forcing their agenda’s on others. Once the time is up, it is important you get everyone to stop. We don’t want cheating. If it wasn’t stuck to the worksheet it wasn’t that important. 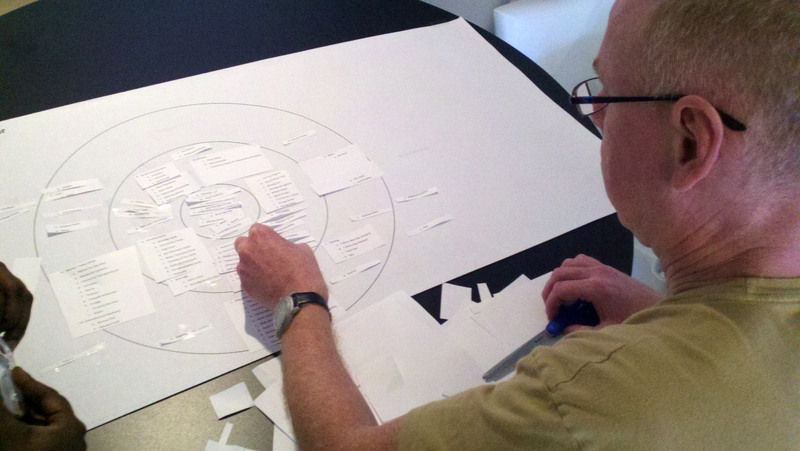 When analyzing the radars from all of your stakeholder sessions, a pattern will begin to emerge. You will see the what items that are universally seen as truly critical, important and peripheral. In this post I described a scenario in which I conducted an exercise to discover how small groups, under time pressure, are forced to think critically in an interactive way. It gives each participant and group a level playing field to express there vision how certain elements from their itemized list are important to success of the given subject. This exercise alone will not give you a full picture, but when combined with a few other engaging techniques you will be well on your way to providing a non bias assessment of how things can be created or improved. Radar Worksheets for each group. Printed packet with Bullet List of items that effect the product service or establishment. Glue sticks or tape (Tape is less messy and forces the participants to commit to a ring). Where UX intersects with brand strategy? User Experience (UX) is not a Function of Marketing. Do you believe products are better when they're design is centered around the human experience?